Nature drawing reminds us that we are stewards of our land, and we need to be dedicated to preserving it for the enjoyment it brings to all levels of our lives. Drawing from life and using nature as our muse fosters compassion and empathy and ultimately reminds us of this interconnectivity. Observational drawing honours the truth in the beauty that is around us. Not a single subject is without it’s own unique set of characteristics that make it impossible not to be in awe. 12 step How-To tutorial on "Peonies for Dad"
I hope this letter finds you well and that you have been enjoying the summer. Perhaps you’ve been gardening, golfing, cottage-ing, visiting family and maybe sneaking in a little travel? I've had some down time, but I have also been spending far more time in front of the computer than any artist should, busy working away on a variety of projects and contracts! I have some exciting things to share with you. Let's catch up shall we? As some of you know, the fine folks at Da Vinci Paint Co. have been working on my custom colour. The long awaited CRYSTAL GREY line should be out by mid fall. It will be a trio set that will include a warm, a cool and a neutral – great for making shadows and creating dramatic tones without the heaviness or opacity typically seen in other tube greys. I’m super jazzed ! It’s been a longtime coming (10 years in the making) and almost 2 years of anticipation since my first meeting with Marcello (owner of DVP) when he proposed the idea! I can’t wait!!! You won’t have to make your greys from scratch any more! Think of the time you’ll save! Last year, I was asked by International Artist Magazine to submit a step by step demo. I am deeply honoured to have this opportunity to reach such a wide audience. Touted as the worlds “best art magazine” it is distributed to over 65 countries around the world! I’ve thought long and hard about the painting I wanted to submit. 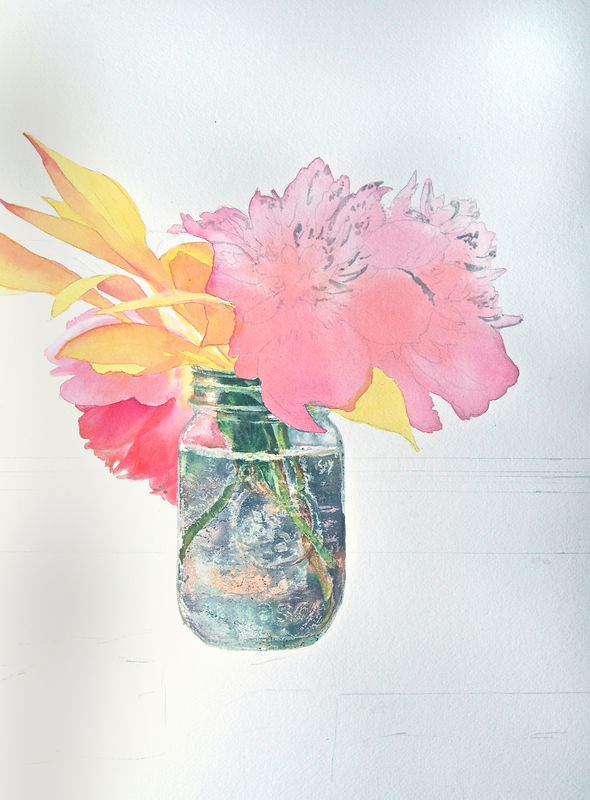 Because it was so popular, and not all of you were able to participate in the workshop, I’ve chosen the peonies in the mason jar as my lesson. “Peonies for Dad” will be featured in an upcoming issue- as soon as I know exactly which one, I will make the announcement. Stay tuned! Each Class is 2.5 hours. You’ll see that while many are GREEK inspired themes, there is a large variety of subject matter and techniques to be covered. I tend to choose themes as a concrete way to illustrate techniques, but these lessons carry over universally and can be applied to most subjects. I think you’ll derive as much inspiration from the following classes as I did from my trip there.